I often read through posts in various online homeschool groups and every so often I come across one from a parent who is panicked about whether their young child is doing enough work. The parent has usually jumped into Gung-Ho Homeschooling with the research, planning and buying of curriculum and resources. And in the beginning it usually goes great for a while until everything just seems to fall apart. Sometimes the child becomes grumpy and uncooperative, sometimes the parent feels like all they are doing is yelling at or nagging the child, and it is obvious to me that everyone is miserable. I understand that feeling, I do. We are raising children today in a highly competitive world where the parent, especially the mother, is often judged for anything and everything that they do. In addition, with social media, there seems to be so many examples online of the perfect homeschooling life and many of these examples seem to revolve around homeschooling younger students as this is much more of a draw than homeschooling teens. With all the pressure of creating the perfect homeschool life, many families find themselves failing in an area that seems to come easy to so many others. But the truth is homeschooling can be hard especially with little ones. Some days when mine were little I just wanted to lock myself in the bathroom to take a mental break from them. I also wanted to leave the house alone whenever possible. And if my mom offered to take the kids for a weekend, I always took her up on that. This is because taking care of little ones is a very demanding job, and throwing homeschooling into the mix makes it that much more. Adding the pressure of getting homeschooling exactly right can sometimes make it too much for any one person to handle. I homeschooled all of mine from the time they were little, and I am here to tell you that there is absolutely nothing wrong with not spending hours upon hours a day doing seat work with your little ones. You do not need to recreate school at home. Of course you can if you like, but it is not necessary. Nor is it necessary to make yourself feel miserable by setting both of you up for failure. 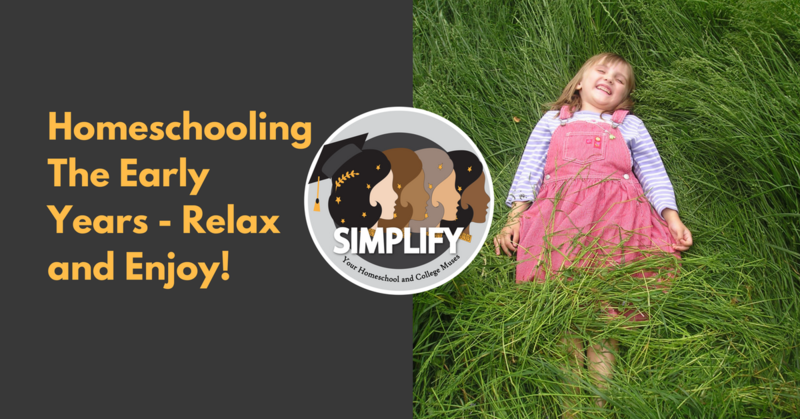 The first few years of school should be stress-free and full of joy and wonderment. Read books to your kids, study phonics in gentle, short lessons, work on math in small bursts, introduce the kids to the joy of audiobooks, take them on walks, play in the sand, let them go wild with Legos, get them working in the kitchen, let their imaginations take off. Do anything or do nothing. Either way, it will be ok. There will be plenty of time for learning all they need to know for school, but they will never be little again, and they will never know the joy of learning if you do not teach it to them. This is what I have learned over the years. I look at my kids, the ones who seem so old now. I am happy to have a teenager and two young adults. I love conversing with them and I love seeing them begin their own lives. But I miss those days that we did nothing, those days we all enjoyed so much. Days of parks and ducks, of swimming and laughing, of mud and sand, of Harry Potter dress-up and E.B. White audiobooks. It was so simple and yet so effective. It was wonderful.